Click Here to Download Our Free Sheet Mulching Guide! Sheet mulching, also known as Lasagna Mulching™, is a means of lawn removal by creating weed barriers using organic compost, mulch, and recycled cardboard. By layering these materials appropriately, you can effectively remove your heavy water-consuming lawn and leave behind rich, fortified soil for a new productive gardening space. During these drought conscious times, this method is a great no-dig way to remove your lawn without having to haul any material off to a landfill.The products you will need for a safe and effective sheet mulching include organic Clean Green Compost, organic Unscreened Mulch, and our recycled cardboard. Clean Green Compost is blended by our sister company, Grab N’ Grow, and is made from clean green waste materials such as grass clippings, leaves, and brushes that landscape contractors and homeowners bring to our yard. Grab N’ Grow only accept clean green waste and all loads are inspected upon arrival in our yard. No municipal or curb-side waste is accepted. Once the materials are inspected, ground, and screened they compost them at a minimum of 131° for at least five days. Clean Green Compost is an important product for sheet mulching because it will condition your soil and break up any clay/adobe compaction that may be present beneath your existing lawn. Our organic Arbor Mulch, is the next vital ingredient you will need for an effective sheet mulching application. 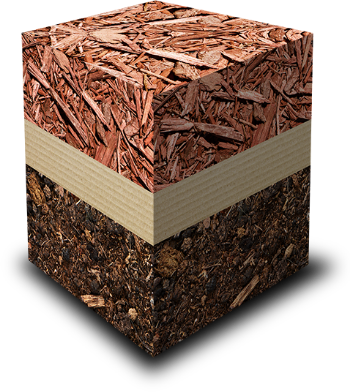 Arbor Mulch is OMRI listed and consists of soft woods such as pine, alder, fir, poplar, redwood, and acacia which are ground into small pieces that include “fines.” This mulch is the perfect solution for moisture retention, weed suppression, and erosion control—all important components for a successful sheet mulching application. Why is thinking about sheet mulching so important right now? Sure, manicured lawns looks attractive in the summer time and provide a play space for children. However, the problem is that lawns on average use up to 80% more water than low-water use plants or drip-irrigation systems. By removing unproductive, thirsty lawns and reusing the space for a productive vegetable garden or drought-tolerant native plant garden you can conserve our precious water resources AND save money on your next utility bill! To help make this an even better money and water saving opportunity, the City of Santa Rosa and the City of Sonoma are offering a drought-special rebate program for homeowners and businesses who remove their turf or upgrade to a more efficient irrigation system. Santa Rosa residents click here to learn how you can participate in your city’s lawn removal rebate program. Sonoma residents click here to learn how you can participate in your city’s lawn rebate program. Valley of the Moon residents click here to learn how you can participate in your city’s lawn rebate program. Save money, save water, and optimize your gardening space!